8.3" x 10.3" stitched on 18 count. Dragon Castle cross stitch pattern... 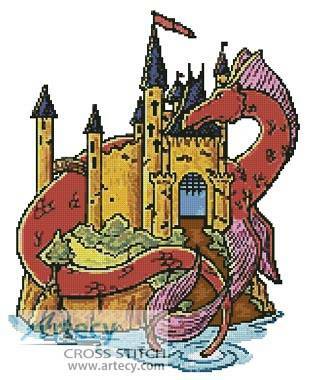 This counted cross stitch pattern of a Dragon draped around a castle was designed from clipart used courtesy of Dover. You can see their website at http://store.doverpublications.com/ Only full cross stitches are used in this pattern.